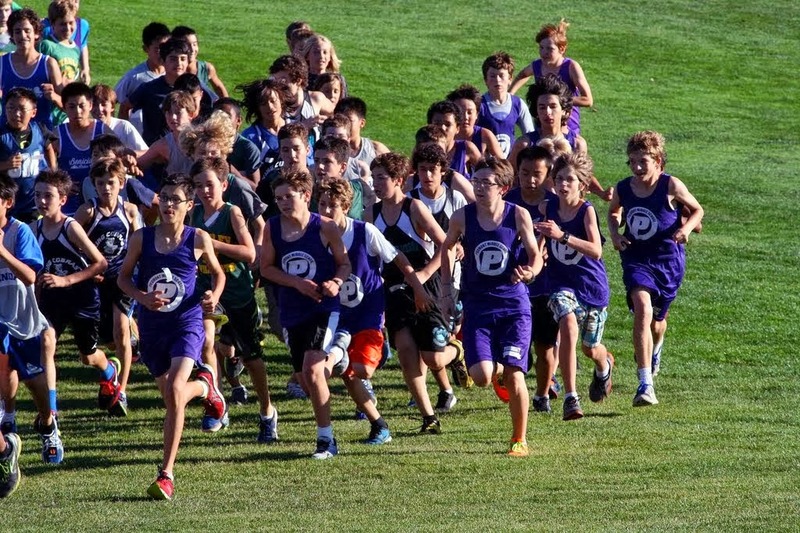 In the first race of the day, 6thgrade boys, we had three kids among the top 20 with Josh Berg, Kihiro Lambert and Colby Brookfield finishing in 12th,13th and 17thplaces respectively. Rounding out our top five finishers in the race were Cutter Mitchell in 25th and Matthew Sprague in 29thplace. For the 6th grade girls we had two girls in the top 10, Maggie Black in 4th place and Sophia Zalewski in 6th places, very solid performances by both young ladies. Our next finisher was Samantha Castro, 22nd place, followed by Kelly Mitchell in 28th and Sophia Loucks in 45thplace. In the 7 & 8th grade boys race, Lorand Cheng continued his fine season with a 4th place finish overall and a new 7thgrade PMS course record of 8:11.1. Next was 8th grader Vincent Titterton in 9th place and a time of 8:26.6. The third PMS finisher across the line was Toby Fischer in 11th place in 8:31.4, followed by Walter Teitelbaum in 13th place and a time of 8:35.6. Our fifth finisher was Dylan Thayer in 19thplace and a time of 8:46.9. On the ladies side, our 7&8th grade girls had another strong showing and a new 7th grade PMS course record for Erin Hong in 1stplace overall and a time of 8:21.7. This was her 3rd course record in as many tries. Piedmont girls also garnered 2nd, 3rd, 5th and 10th places with Clarissa Lam, Ellie Coleman, Elie Cole, and Eva Hunter respectively. This is outstanding team depth and I would be remiss if I did not also mention Sophia Barker in 13th place, Minnie Cooper in 19thplace and Lily Keville in 20th. 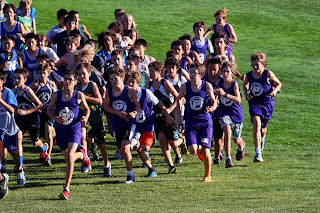 On Thursday October 3,a small group of 6th graders ran in a meet in El Cerrito. Some say this course has a certain charm, and harkens back to the early days of our league. Anyhow, “official results” are not yet available; when they are they will be posted on our website. They all ran very hard. Josie was leading at the start. She got passed on the first loop but I kept telling her to keep her in site and get her rhythm. At the very last loop I told her to focus on the couple of up hills and try not to let the gap grow and take full advantage of the downhill, especially the very last one. Sure enough, she made her move at that last down behind the bleachers and took the lead and down the chute. Maria was solo 3rd and kept her position throughout the entire race. Fiona and Jihae worked with each other and passed a few girls in the end to capture 4th& 5th. They were neck and neck with each other. 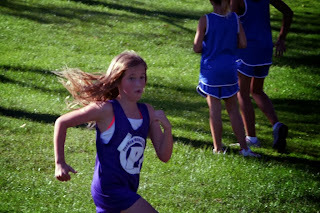 All girls ran a very good race. Ashley Nelson ran a solid race and finished in 11th place. As for the boys, Jayden hung in there and pretty much kept his position throughout the race. Max was very even and ran solid, and his down the chute sprint was very memorable. He passed the boy in front of him right at the very end. Durant really tried hard, even though he kept telling me that his throat hurt and said he walked a little, which I did not witness. Benji ran a solid pace race. Mathew was trying very hard and I was very proud to see his efforts. All in all, they showed some great sprints down the shoot and successfully passed kids in front of them.